At a time when President Trump’s repeated demonizing and denigration of Central Americans seeking refuge in this country is whipping up anti-immigrant fears and hostility, a Newington gun dealer has added its take on this controversy by targeting so-called “illegals” in a fake advertising flyer placed on social media. 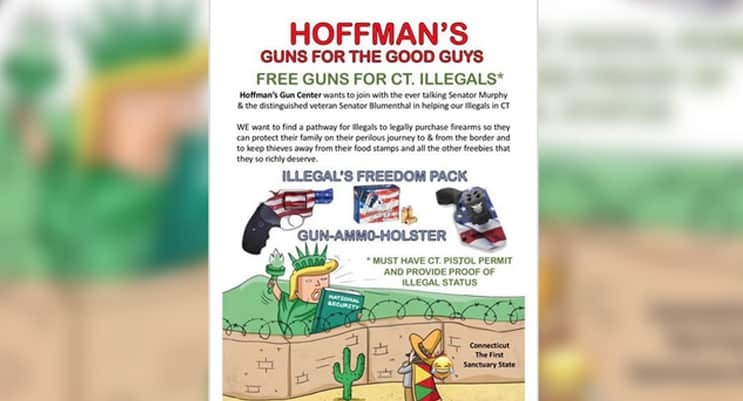 Using the heading “FREE GUNS FOR CT. ILLEGALS,” Hoffman Guns for the Good Guys” Facebook page recently featured a derisive attempt at humor at the expense of undocumented immigrants through a posting with a cartoon lampooning the situation at the southern border and text which some critics view as inflammatory. For example, the term “illegals” is considered a pejorative to those opposing Trump’s attacks on Hispanic immigrants. 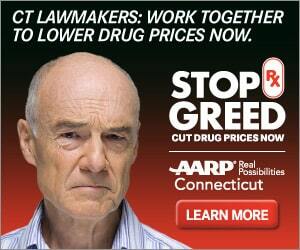 However, within a week the cartoonish flyer was removed and what one state leader called a “quasi-apology” appeared. However, by then the Hoffman posting had been shared at least 200 times and had attracted numerous comments that its contents were racist, disgusting, stupid, tone-deaf and “contained half-baked immigration views” that alienated the store’s customer base. “Hoffman’s was hoping there’s no such thing as bad publicity, but I’m hearing they’re wrong,” said state Senator Matthew Lesser, who copied the cartoon to his Facebook page, denouncing it as offensive. “White supremacy and human trafficking are shameful stains on our society, not a cheap marketing gimmick,” said the Middletown Democrat, a former state representative who is a member of the legislatures Black and Puerto Rican Caucus. The flyer’s most prominent element is a cartoon depicting the Statue of Liberty sporting President Donald Trump’s iconic blond comb-back haircut while holding a book that says national security. In the background is a verdant green landscape. Across a brick and barbed wire wall, a man in a multi-color Mexican-style serape looks north from the desert while carrying a crying emoji. 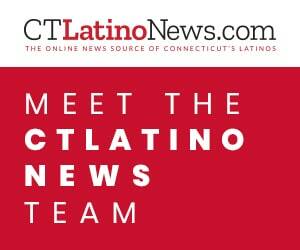 Robert Fishman, executive director of the Connecticut Immigrant and Refugee Coalition and a former director of the Jewish Federation of Connecticut, said the Hoffman posting and its anti-immigrant tone seemed to be an outlier and that he did not see anti-immigrant sentiment becoming more visible in the state. Meanwhile, Lesser and others placed the Hoffman posting in a broader context. “This disgusting behavior stems directly from the racist anti-Latino antics President Trump has normalized across the country,” the state senator said. This message did not sit well with Yanil Teron, executive director of the Center for Latino Progress in Hartford who called it insulting. “That isn’t an apology but a Trumpian statement applauding the racist base for laughing at a very offensive flyer, she said.